Last time I wrote that the CHSSP is taking on two new History Blueprint Units in 2012-2013. One of these units, “Sites of Encounter in the Medieval World” is for 7th grade. The following is a description of the plan and the content for the unit. The CHSSP will convene a team of world historians, led by historian Teofilo Ruiz of UCLA, and seventh-grade history teachers to create a History Blueprint unit entitled “Sites of Encounter in the Medieval World.” It will incorporate recent historical scholarship to teach young students about shared networks and practices among the regions specified in the California content standards – the Middle East, China, Japan, the West African kingdoms and Europe. There are nine standards from the medieval regional groupings that address multicultural contact, exchange, trade, or travel, which we will combine into the new unit. In this way, the CHSSP can demonstrate that teachers will not teach an extra unit, nor will they depart from the standards they are required to teach. While the proposed medieval world unit will draw on several different models, it focuses on the key historical question: How were products, technologies and ideas shared at sites of encounter in the medieval world? According to Teofilo Ruiz and his colleagues in the “Sites of Encounter and Cultural Production” project, a site of encounter is a geographical location where people from different cultures construct networks designed to exchange objects, customs, and knowledge according to shared norms. The exchange of products sparks new ideas and cultural productions, which then diffuse outward from the site of encounter. Although seventh-grade students may be unable to grasp the abstract implications of this concept, a site of encounter is a concrete location, and products and technologies are concrete objects that young learners can easily understand. As they examine these specific objects and their transmission through specific locations, students will analyze processes of exchange, network formation, diffusion and adaptation. They will then have a conceptual model which they can apply to ideas, knowledge, and other abstract cultural processes. The unit will begin in mid-twelfth-century Sicily, a major site of exchange between the Muslim and Christian worlds. The students will examine the world map al-Idrisi and his team of Muslim, Jewish and Christian mapmakers drew for Christian king Roger II (r. 1130-1154), in The Book of Roger. The descendant of Norman adventurers who had taken Sicily from Muslim North African rulers in 1072, Roger II and other Norman kings ruled over a Muslim, Christian and Jewish population who co-existed peacefully, as Ibn Jubayr and others record. 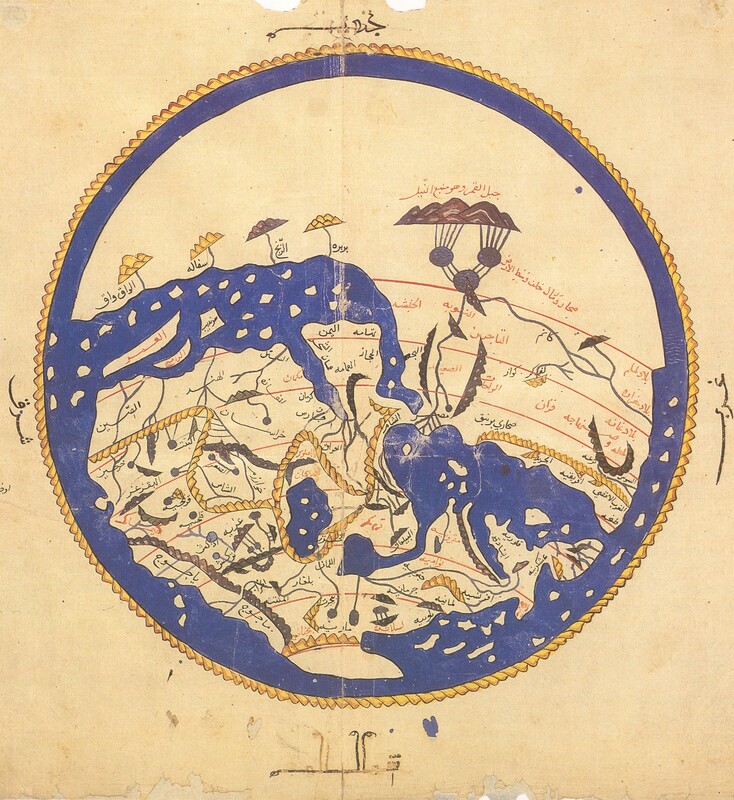 Students will compare al-Idrisi’s map to a modern historical map to locate the major states, populations, cities, and trade routes of the twelfth-century Mediterranean. They will trace the multicultural translations of Greek science, medicine and philosophy from Arabic into Latin by Muslim, Jewish and Christian scholars in Sicily and Spain. Diffusion and adaptation of those translations fueled the intellectual development of the emerging universities in Europe. The second site of encounter will be Majorca and will draw on ideas from Before Columbus, Felipe Fernández-Armesto’s study of population movements, trade and exploration from 1229 to 1492. The lesson will emphasize the cosmopolitan mercantile population of the island – Muslims/Moors, Genoese, and Jews, as well as the Catalans who conquered it in 1228, and its role as a center of trade between the Arago-Catalan world and North Africa, as well as the site of new industries, such as shipbuilding. Students will examine shipping and navigational technologies transferred from the Muslim world, such as the astrolabe and the lateen sail, which stimulated the creation of ships strong enough to transit the barrier of adverse currents across the Strait of Gibraltar and enter the Atlantic Ocean. Using the maps of the Catalan Atlas, produced in Majorca in 1375 by a Jewish scholar named Cresques Abraham (or perhaps Abraham Cresques) and his multi-cultural team, students will analyze the careful notation of coastal topography, Atlantic islands and other features of portolan charts, and measure the advances in cartography and geographic knowledge from al-Idrisi’s map. Students will learn that these components enabled Atlantic exploration. After examining two sites of encounter in the Mediterranean featuring shipping, trade and maps, students will explore Janet Abu-Lughod’s theory of the world system of the thirteenth century. They will analyze how the trade routes, through the Mongol empire and along the Silk Road, and by sea, were divided into overlapping trade circuits. Merchants exchanged their goods at entrepôts, or hubs, such as Quanzhou on the southeast coast of China. Students will explore the spatial organization of the multicultural entrepôt, with its Muslim and Hindu quarters, and its web of trade connections to Persia, India, China, Japan and Korea. Using excerpts from the accounts of Marco Polo and Ibn Battuta, students will analyze how the outsider views a different (and more advanced) culture and what he learns about himself, his own culture and the world at the site of encounter. Students will read excerpts from Ibn Battuta’s Rihla (Travels) to visit three sites of encounter – Mali, Cairo, and Melaka. At Mali, the lesson will include an examination of the gold-salt trade, the connections between Muslim merchants and the spread of Islam in sub-Saharan Africa, and depictions of Mansa Musa in the Catalan Atlas. Following Mansa Musa as well as Ibn Battuta, students will virtually explore the route from Mali to Cairo. They will begin exploring Cairo using the drawings from Umm El Madayan, locating the souk, the caravanserai, and other features of Muslim trade cities, and then analyze Ibn Battuta’s description. The final site of encounter will be Melaka, the premier entrepôt of the Indian Ocean trade system. As a culminating activity, students will adopt the perspective of a fourteenth-century visitor and write a travel narrative of their own, based on research into another city described by Ibn Battuta. With Teofilo Ruiz as faculty advisor, the CHSSP will organize a team of scholars to provide intellectual direction, historical focus questions, primary sources, and content lectures to teach four teacher leaders who will be selected to write the lessons for the “Sites of Encounter in the Medieval World” unit. Using the sources, these teacher leaders will prepare lessons appropriate for teaching the content to 7th-graders. CHSSP leaders will synthesize the lessons into a cohesive unit, and, along with historians, give the teacher leaders feedback on the first drafts. Teacher leaders will then prepare second drafts of the lessons. After another round of critique, the CHSSP will revise the unit a third time and arrange for seventh-grade teachers to pilot the curriculum in their classrooms. When the results of the pilot are compiled, the CHSSP will revise the unit into a final version, and publish it free of charge on our website. Nicole Gilbertson, “Sites of Encounter in World History,” Perspectives on History 50, no. 5 (2012), 32-33. Al-Idrisi, Geography [Opus geographicum], 5-7, trans. by Karla Mallette, in The Kingdom of Sicily, 1100-1250: A Literary History (Philadelphia: University of Pennsylvania Press, 2005), 146-148; Mallette, Kingdom, 1-16. James M. Powell, “Frederick II and the Rebellion of the Muslims in Sicily, 1200-1204,” in The Crusades, The Kingdom of Sicily, and the Mediterranean, Variorum Reprint (Aldershot, Hamp. : Ashgate, 2007), XIV, 13-22. Marco Zuccato, “Gerbert of Aurillac and a Tenth-Century Jewish Channel for the Transmission of Arabic Science to the West,” Speculum 80 (2005), 742-763. Felipe Fernández-Armesto, Before Columbus: Exploration and Colonisation from the Mediterranean to the Atlantic 1229-1492 (London: Macmillan Education, 1987). Palmira Brummett, “Visions of the Mediterranean: A Classification,” Journal of Medieval and Early Modern Studies 37 (2007), 9-55. Janet Abu-Lughod, “Before European Hegemony: The World System A.D. 1250-1350 (New York: Oxford University Press, 1989). Robert McIntosh, The Peoples of the Middle Niger: The Island of Gold (Malden: Blackwell, 1998). Ibn Battuta, C. Defrémery, B.R. Sanguinetti, C.F. Beckingham, and H.A. R. Gibb, trans. and eds., The Travels of Ibn Battuta, A.D. 1325-1354. 4 vols. Hakluyt Society, 2nd series, nos. 110, 117, 141, 178 (Cambridge: Hakluyt Society at University Press, 1958-2000); Abderrahman Ayoub and Francesco Conti, Umm el Madayan: An Islamic City Through the Ages (Boston: Houghton Mifflin, 1994); Paulina B. Lewicka, “Restaurants, Inns and Taverns That Never Were: Some Reflections on Public Consumption in Medieval Cairo,” Journal of the Economic and Social History of the Orient 48, no. 1 (2005), 40-91; Kenneth R. Hall, “Local and International Trade and Traders in the Straits of Melaka Region: 600-1500,” Journal of the Economic and Social History of the Orient 47, no. 2 (2004), 213-260; Craig A. Lockard, “‘The Sea Common to All’: Maritime Frontiers, Port Cities and Chinese Traders in the Southeast Asian Age of Commerce, ca. 1400-1750,” Journal of World History 21, no. 2 (2010), 219-247.